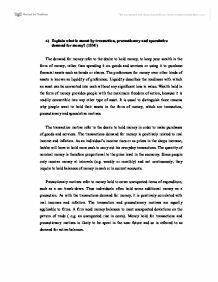 a) Explain what is meant by transaction, precautionary and speculative demand for money? (10M ) The demand for money refer to the desire to hold money; to keep your wealth in the form of money, rather than spending it on goods and services or using it to purchase financial assets such as bonds or shares. The preferences for money over other kinds of assets is known as liquidity of preference. Liquidity describes the readiness with which an asset can be converted into cash without any significant loss in value. Wealth held in the form of money provides people with the maximum freedom of action, because it is readily convertible into any other type of asset. ...read more. The quantity of nominal money is therefore proportional to the price level in the economy. Since people only receive money at intervals (e.g. weekly or monthly) and not continuously, they require to hold balances of money in cash or in current accounts. Precautionary motives refer to money held to cover unexpected items of expenditure, such as a car break-down. Thus individuals often hold some additional money as a precaution. As with the transactions demand for money, it is positively correlated with real incomes and inflation. The transaction and precautionary motives are equally applicable to firms. A firm need money balances to meet unexpected deviations on the pattern of trade ( e.g. ...read more. There is also an inverse relationship between interest rate and the market prices of fixed interest government securities. At high rate of interest, individuals expect interest rates to fall and bond prices to rise. To benefit from the rise in bond prices, individuals use their speculative balances to buy bonds. Thus when interest rate are high, speculative money balances are low. At low rate of interest, individuals expect interest rate to rise and bond prices to fall. To avoid the capital loses associated with a fall in the prices of bonds, individuals will sell their bonds and add to their speculative cash balances. Thus, when interest rate are low, speculative money balances will be high. There is an inverse relationship between the rate of interest and the speculative demand for money. Money balances held in this form are called idle balances. ...read more.